A beautiful, fashionable area rug can add charm and warmth to any room. But no matter what type of area rug you have, it’s important to protect your investment with regular professional cleanings from EcoClean Dry Carpet Cleaning right here in Huntington Beach, CA, we recommend a deep “dry” extraction cleaning for most area rugs at least once a year to remove allergens, dust mites, sand, dirt and other particulates that are trapped deep down in the fibers of your area rug. 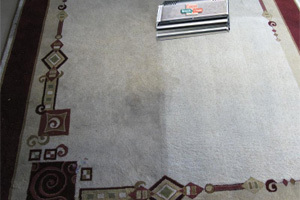 STEP 6: Brush & Clean – The Rug will again be dry extracted with our specialty counter rotating brush machine.